When Eve plucked the proverbial apple from the tree in the Garden of Eden it very well may have been in South Tyrol, Italy. 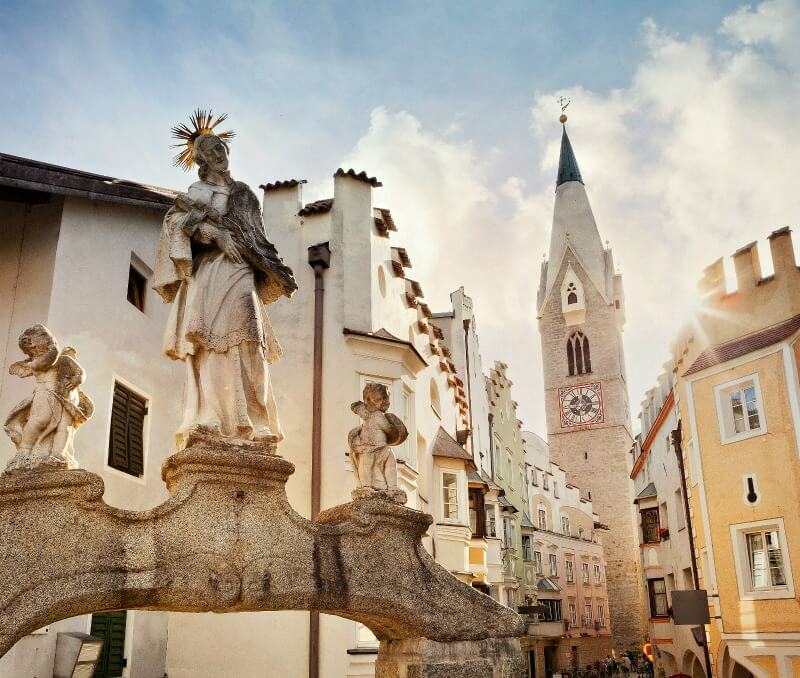 Crowning the far northern edge of the country, this mountainous haven, also known as Alto Adige and Südtirol, is blessed with some of the most stunning scenery in the world. 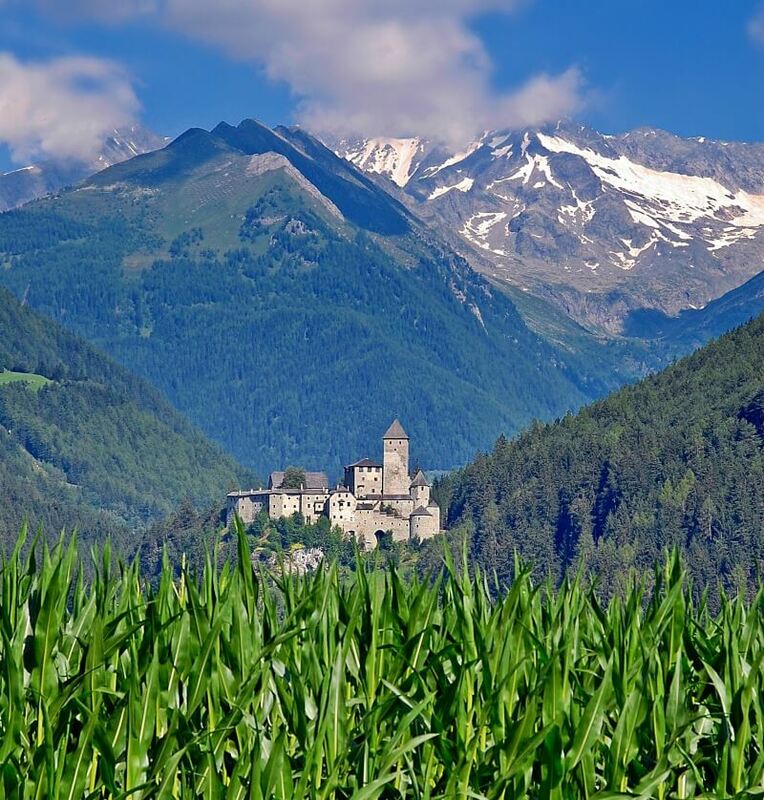 Here, Mediterranean valleys crash into Alpine glory producing striking snow-capped vistas illuminated by terrain ablaze with tropical lushness. One can’t help but be in constant awe among such beauty. 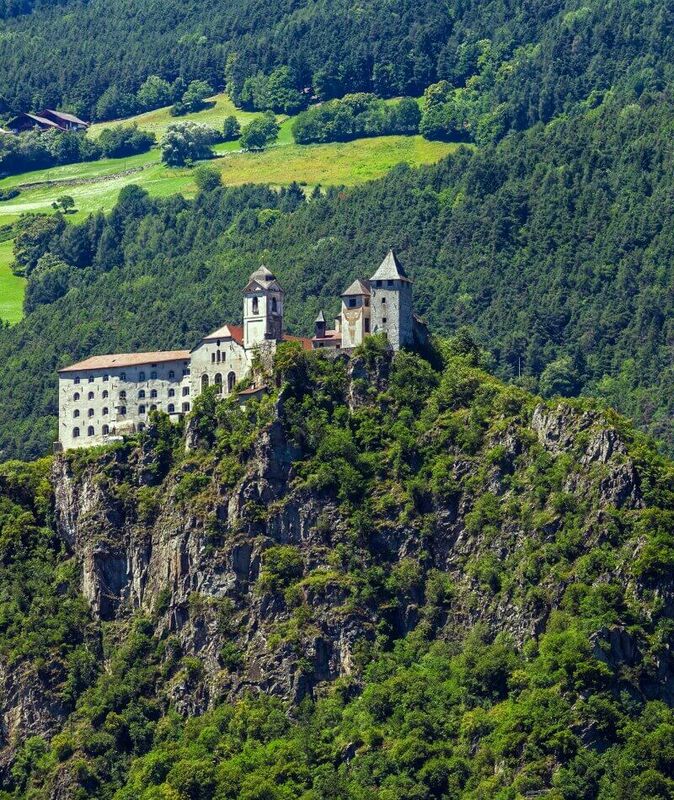 But beauty is not the only flourishing charm of South Tyrol. Upon arriving, you’ll almost immediately encounter apple orchard after apple orchard. Red, green and gold South Tyrol apples beam from the fertile valleys shared by ancient castles, villages and vineyards. When wandering along historic Waalwegs still channeling pristine water to lands once ruled by royalty long past, the temptation to nab an apple from a tree and sink your teeth into its juiciness is hard to resist. 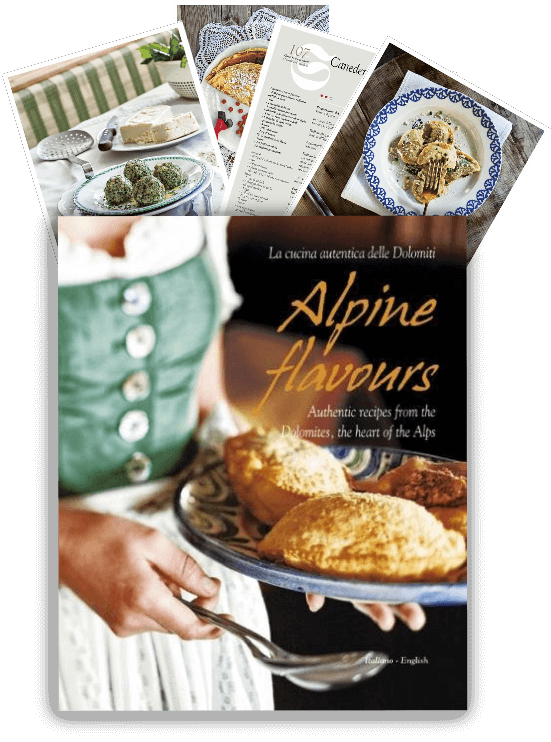 However, doing such delicious mischief would be a foolish disservice to the hard-working South Tyroleans whose livelihoods depend on bountiful harvests each year. 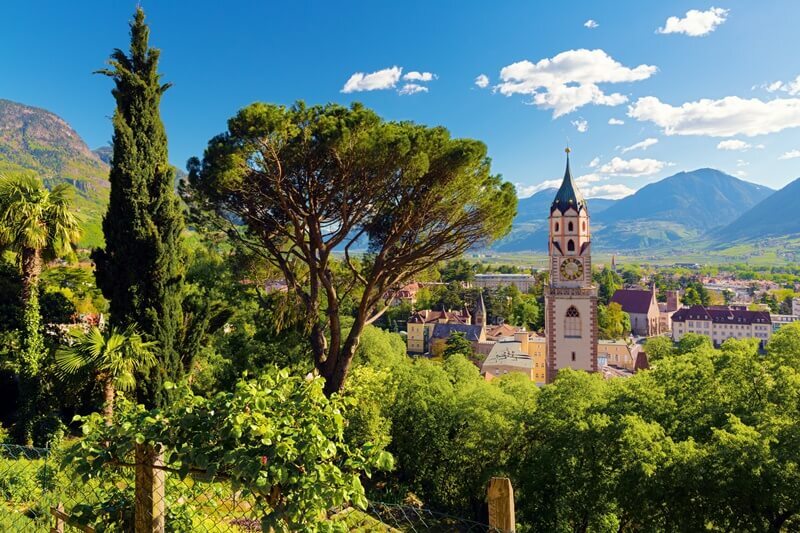 With over 18,000 hectares (picture 15,000 baseball fields) of apple orchards spread throughout the region, South Tyrol is the largest self-contained apple-producing region in Europe. Apples are a fundamental element of the South Tyrolean economy. These luscious delights are not only a gift for your taste buds, but are integral in many cosmetics and spa treatments in South Tyrol. Around 8,000 South Tyrolean families depend upon fruit production for their livelihood. On average, South Tyrol produces 900,000 tons of apples supplying half the Italian apple market, up to 15 percent of the European market and about two percent of the apples worldwide. 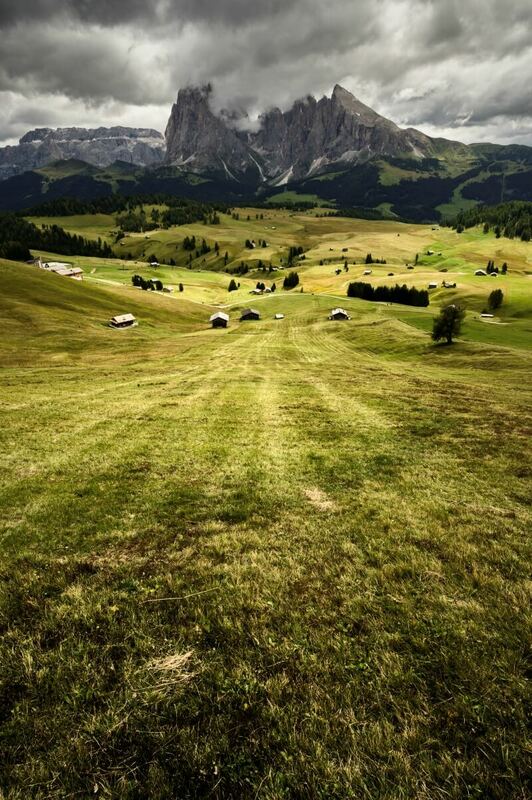 Of all the arable land in South Tyrol, apple production dominates in comparison to all other crops, dairy and meats. In the late 1800s, Friedrich Wilhelm Raiffeisen launched the apple cooperative movement to ensure the economic survival of the apple industry in South Tyrol. The movement instilled principles of mutual help, self-governance and self-responsibility. These tenets allowed small growers to expand their market share and foster a brand reputation that is second to none in the apple world. Today, over 90% of apple production in South Tyrol is controlled by the cooperative system. We walked through a sun-soaked vineyard, passing a small church that looked as old as the mountain itself, until we came to a sheer cliff edge. A bite into a South Tyrolean apple is a delectable adventure unto itself, but to gain a better understanding of the apple’s importance to the people of this region, our friend and South Tyrol expert, Reka Hukari suggested touring Kurmark-Unifrut, a co-op in Margreid— a charming hamlet of about 1,000 villagers located 25 minutes south of Bolzano. 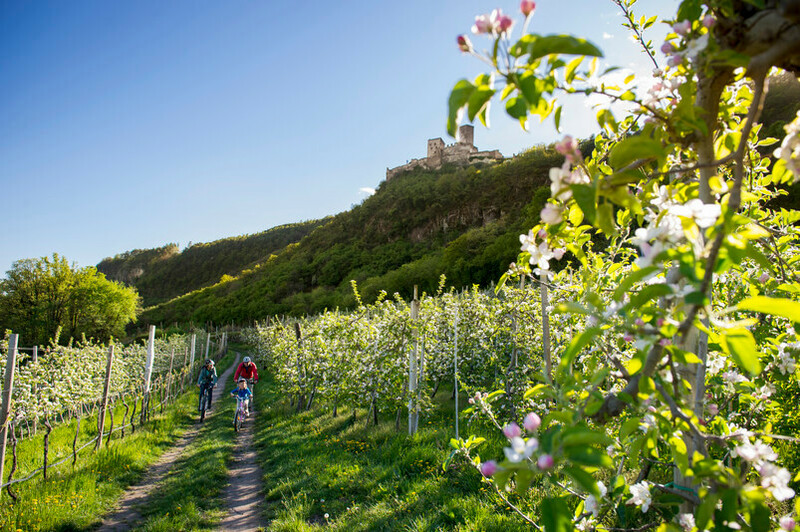 In the spring, South Tyrol’s apple trees awaken with white and violet flowers. The blossoming spectacle softly kisses your nose with sweetness welcoming you to the new season. Kurmark-Unifrut is a 480-member strong co-op cultivating almost 800 hectares and producing 55,000 tons of fruit each year. Unifrut was founded in 1946 while Kurmark was founded in 1960. The two co-ops merged in 2001. We met Reka in the village of Kurtatsch mid-morning and took a little time to stroll through its lovely cobblestone streets in the warm morning light. Before heading to Margreid, Reka led us up a nearby mountain to get the lay of the apple production in the valley. 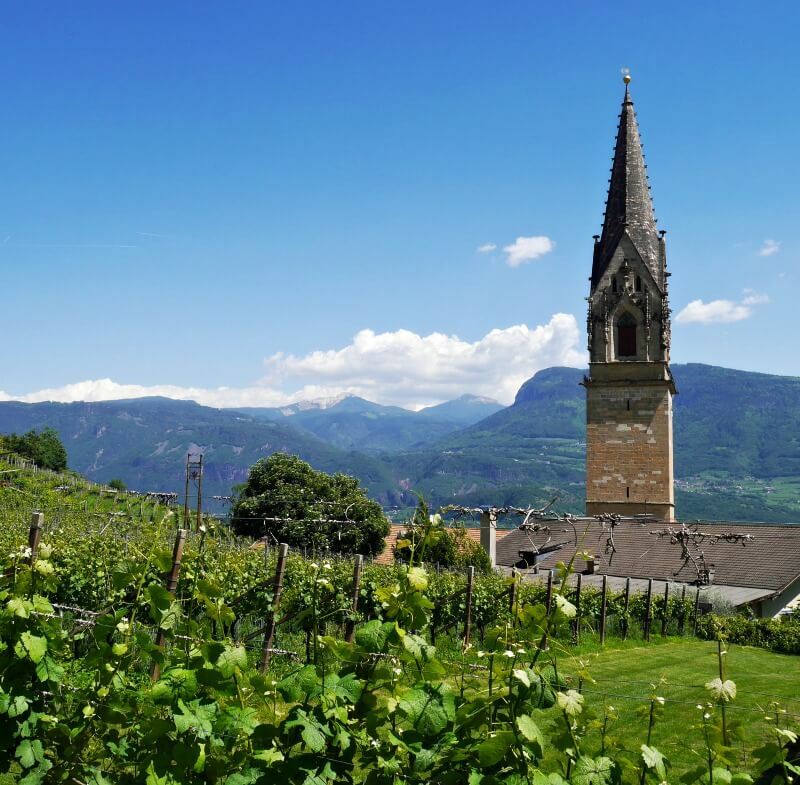 We walked through a sun-soaked vineyard, passing a small church that looked as old as the mountain itself until we came to a sheer cliff edge. Below us unfolded a vast checkerboard of orchards in every hue of green. From this vantage point, the importance of the apple to South Tyrol really hit home. Reka explained how the valley basin is home to the orchards while the vineyards cling higher up the slopes. We learned apple trees thrive in wet soil, but the grape vines do not like “wet feet” as she put it. South Tyrolean expert, Reka Hukari, shows us the vast apple orchards of the valley. We sped back down the mountain to the Kurmark-Unifrut headquarters and were graciously met by Luis Codalonga, the co-op’s tour guide and wizard of all things apple. Luis instructed us to adorn some gnarly looking hairnets and neon yellow safety vests, which we of course memorialized with frequent photos. We then sat down for a bit and received an introduction to Kurmark-Unifrut where we discovered that Royal Gala, Golden Delicious and Granny Smith are its dominant varieties. Next, Luis led us from the main office to a nearby orchard on the property. Here Luis explained how the co-op harmonizes apple production with the environment by controlling pests through green fertilization and pheromone traps, among other techniques. We’re big believers in working in concert with nature and hearing how the co-op embraces such practices made us all the more excited to try its apples. Luis also touched on the science behind deciding when to harvest. Kurmark-Unifrut growers perform frequent tests on apples in the orchards to assess sugar, density and starch content. Only when the content levels meet exacting standards are the apples harvested. The harvest in South Tyrol varies by apple, but begins as early as August and ends in October. Once picked, Kurmark-Unifrut stores the apples in immense cold storage buildings. According to Luis, these behemoths were designed to architecturally-mimic an apple crate. Upon walking in we were immediately thankful we brought our jackets. Orange cellar doors lined the long hallway. Within, crates flush with apples sat on top of each from the floor to ceiling. Each cellar can hold 1,000 crates we were told, which equates to 300 tons of apples. The co-op segments the apples with green and gray crates. Gray crates hold apples designated for baking and juicing. Green crates contain apples ready for consumption. The purpose of the cold storage facility is to slow the physiological development of the apples without using chemicals. Low oxygen levels and cold temperature ensure the apples stay fresh throughout the year. This approach does not come without risk. We were surprised to learn that people have lost their lives foolishly thinking they can dart in and out of a cellar. The low oxygen levels can claim victims without warning. Next, we toured the co-op’s apple sorting and packing facility. While the cold storage building was eerily quiet, this facility was alive with action. The hum of machinery and hustle followed us on every step. Not to mention the sweet aroma of apples! The luster of red, gold and green apples sprung brightly against the drab equipment. If you time your visit right in the spring, you’ll witness the flowering of the apple orchards. The trees awaken with white and violet blooms that blanket the valleys all the way up the rolling hillsides. Luis informed us that timing is everything when it comes to apples, so upon leaving cold storage the apples must be processed, packed and shipped as efficiently as possible to guarantee freshness. Kurmark-Unifrut prides itself on producing the freshest produce to its consumers and has made substantial investments in the latest technologies to that end. The co-op uses state-of-the-art optical technology that captures 64 images of each apple as it passes through a water lane. This produces a 3D replication uncovering imperfections at a processing speed of 5-7 apples per second. Wizard of all things apple, Luis Codalonga, explains how Kurmark-Unifrut uses state-of-the-art technology to ensure superior apple quality. At the end of the 10 optical sorting-lines, bins lower to capture the apples using a vacuum suction technique. Final inspection is performed with the human eye before packaging. The co-op packages apples for multiple brands, which vary by the destination country. Each package includes the European Protected Geographical Indication (PGI) seal of quality. Thirteen apple varieties in South Tyrol currently hold PGI status, which guarantees quality, uniqueness and exceptional taste. Only producers who adhere to strict production guidelines receive the designation. Following the tour, Luis treated us to an apple tasting, which included sampling a glass of apple juice. Similar to boxed wine in the United States, South Tyrolean grocers carry boxed apple juice varieties. Packed with flavor and softness, the juice wowed our lips. We reveled in its freshness and made a note to hit a local grocer before heading back to our resort. Next up were the apples. We were familiar with a few of the varieties, including Braeburn, Red Delicious, Granny Smith and Royal Gala, but were not at all prepared for the lush juiciness that came with every bite. We love American apples; however, South Tyrol’s apples stood a mountain apart. They were more aromatic and the flavors seem to burst within your mouth. Kanzi and Modi were unfamiliar to us…and absolutely delightful. These two were our personal favorites. Modi exhibited a more modern taste, golden hues and a juicy burst balanced nicely with acidity and sweetness. Kanzi was both sour and sweet with a crispness that sings between your teeth. Its name means “hidden treasure”. A perfect apple to conclude our visit. We snapped a few final pictures and thanked Luis for the fascinating tour. He made sure we took a handful of apples to enjoy for our hiking outing the following day. 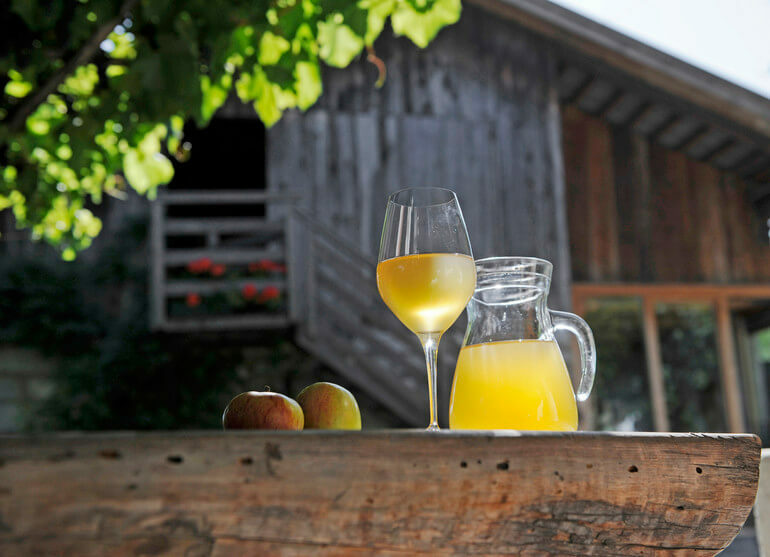 If you’re a fan of apples (and let’s be honest how can you not be), do yourself a favor and explore South Tyrol’s treasured fruit during your visit. Plan a few hikes through the area’s Waalwegs where you can wander by numerous orchards not mention vineyards, forests and Alpine meadows. The aromas and sights you encounter will make your senses dance with joy. Be sure to stop at a wayside hut where you can drop a few coins to sample the local produce and their byproducts. You will not be disappointed. An excellent place to base yourself for an apple-filled adventure is Preidlhof Hotel & Spa in Naturns. The resort sits on a mountainside with an apple orchard running right up to its doorstep! A hike not to miss while staying there is to Castel Juval. 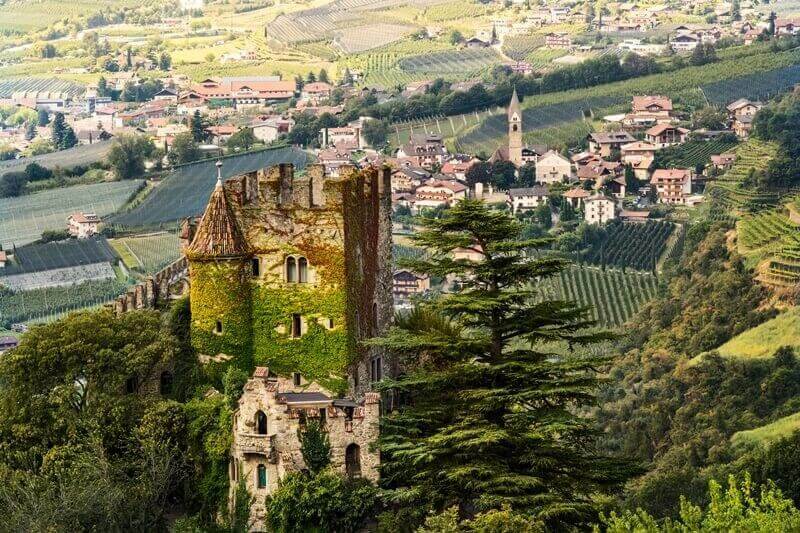 The trail to this medieval stronghold takes you pass numerous orchards and vineyards and gives you unforgettable views of South Tyrol’s Val Venosta. 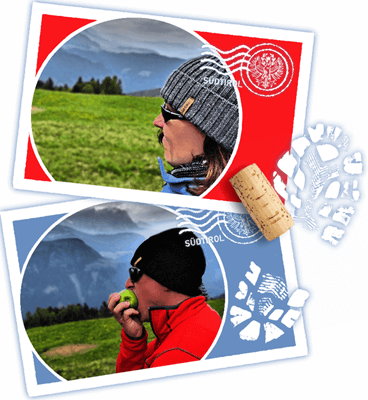 South Tyrol apples provide some of the most picturesque ways to capture a mountain view! If you time your visit right in the spring, you’ll witness the flowering of the apple orchards. The trees awaken with white and violet blooms that blanket the valleys all the way up to the rolling hillsides. Whether exploring on foot or by bike, the blossoming spectacle softly kisses your nose with sweet scents welcoming you to the new season. You can also time your visit in the fall to partake in apple harvest celebrations. One to consider is the apple festival in Naz-Sciaves. Held in early October each year, the festival includes a grand parade, the crowning of the Apple Queen, live music, dance and of course plenty of scrumptious South Tyrolean goodness. No matter when you go, no trip to South Tyrol would be complete without trying its world-famous apple strudel. We dive into this traditional treat after almost every hike. It’s the perfect way to end a day of wandering in this corner of paradise. If this is the first time you’ve heard about South Tyrol, Italy, do your wanderlust heart a favor and discover why it needs to be at the top of your travel wish list. Before traveling to any country, learning some of the local tongue is well worth the time invested. Locals appreciate the effort even if you make a complete mess of their language. We’ve brushed up on Italian for trips to South Tyrol, but have also found it useful to be familiar with German. 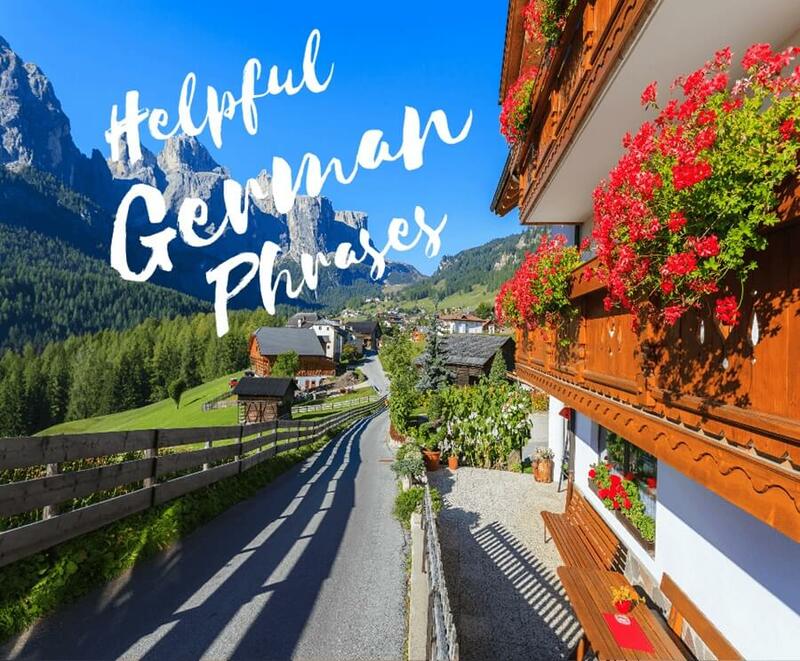 In this post, we discuss some basic terminology and helpful German phrases for common situations you’ll likely come across on your trip to South Tyrol and other German-speaking places. In general, you can get by just fine on very little German. 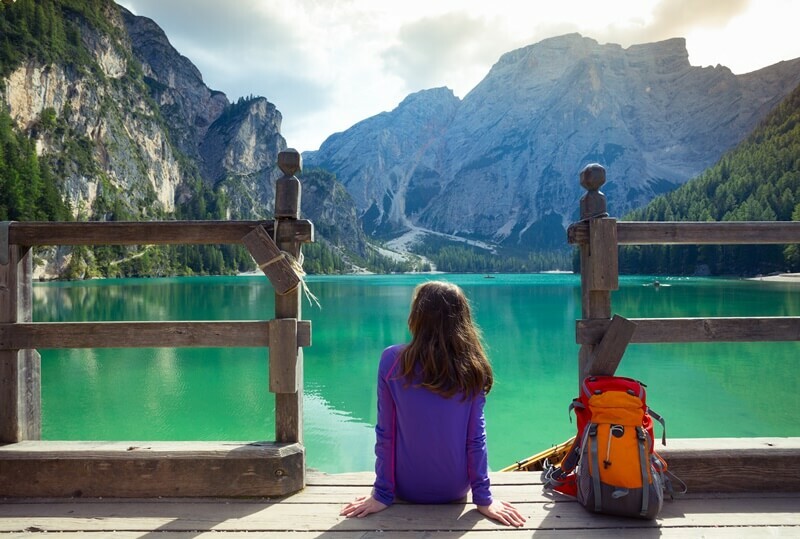 Insider Tip: Before reading any further we’d like to point out that you can access a PDF of the Key German Phrases Guide in our FREE South Tyrol Travel Resources Library. We made it handy to print out or keep on your tablet or phone while traveling. 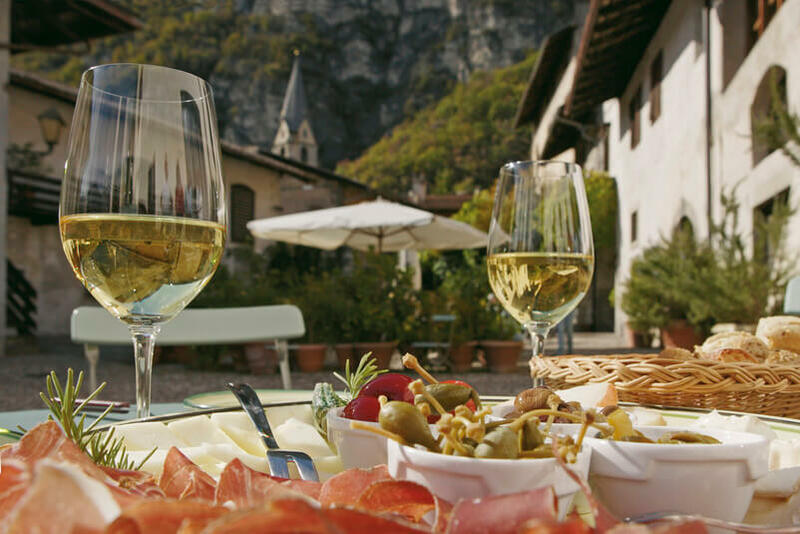 Just like any other trip abroad, don’t be afraid to ask a South Tyrolean to repeat their statement, write down the price, or find out if they speak English. You’ll find that many German speakers are just as self-conscious and apologetic for their own English speaking skills as you will be for your German speaking skills. Personally, we’ve always found traveling to a place where English is not the primary language to be invigorating and a good excuse to flex our mental muscle. Before learning the local lingo, it’s important to understand how letters are pronounced. Then, when you encounter an unfamiliar term, on a menu, for example, you will be able to better guess its pronunciation. Below you’ll find the alphabet (only for letters that vary in sound from English) along with German pronunciation of each letter. Similar to English, German greetings vary by time of day. In the morning, “Guten Morgen” is used, which many German speakers shorten to simply “Morgen”. 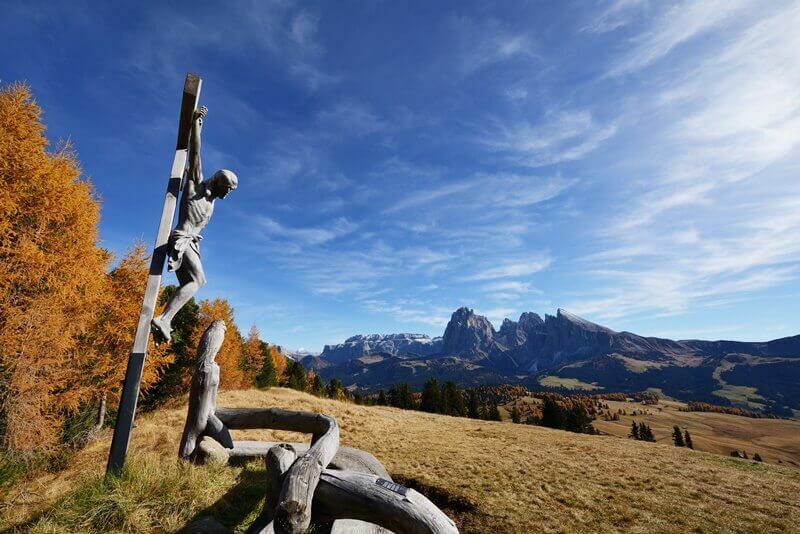 Grüß Gott is a more popular greeting in South Tyrol that we heard frequently when greeting other hikers on the waalwegs. Other more casual greetings are “Hallo” or even “Hi”. To introduce yourself, you can add “Ich heisse _(your name)_”. Sprechen Sie Englisch? = Do you speak English? You’ll hear a variety of goodbyes including “Auf wiedersehen” (or shortened to “Wiedersehen”), “Ciao”, “Tschüss”, “Servus”, and “Bis bald”, among others. Auf wiedersehen is the most formal and Tschüss is used in more informal situations. Bis bald is the same as “see you soon”, so is more properly used when you will likely see the individual again. 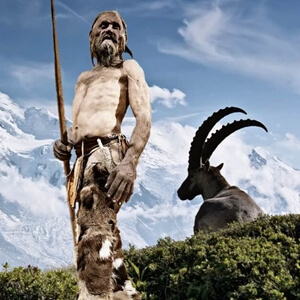 Tschüss and Servus are a couple more informal farewells. In general, we followed the lead of whoever we were meeting and used the same greeting. Knowing some German is most handy when ordering at restaurants, bars and cafes. You can ask for a table with your party size by stating “Tisch für (zwei) bitte.” In this example, you’re asking for a table for two (zwei). With any of these statements, don’t forget please (bitte) and thank you (danke). When ordering, begin with “Ich möchte” for “I would like”. Below are some common drinks and food you may be ordering. Das Menu? = Do you have a menu? Ist die Küche geöffnet? = Is the kitchen open? Wo ist die Badezimmer? = Where is the bathroom? Wieviel kostet das? = How much does this cost? Können Sie das bitte aufschreiben? = Can you please write that down? Keep in mind that dining in many European countries is an experience, so the service is much slower. Europeans tend to take their time much more so than Americans while eating, so you’ll likely need to ask for your bill at the end of the meal with “Rechnung bitte” if the Yankee in you is ready to ramble on. 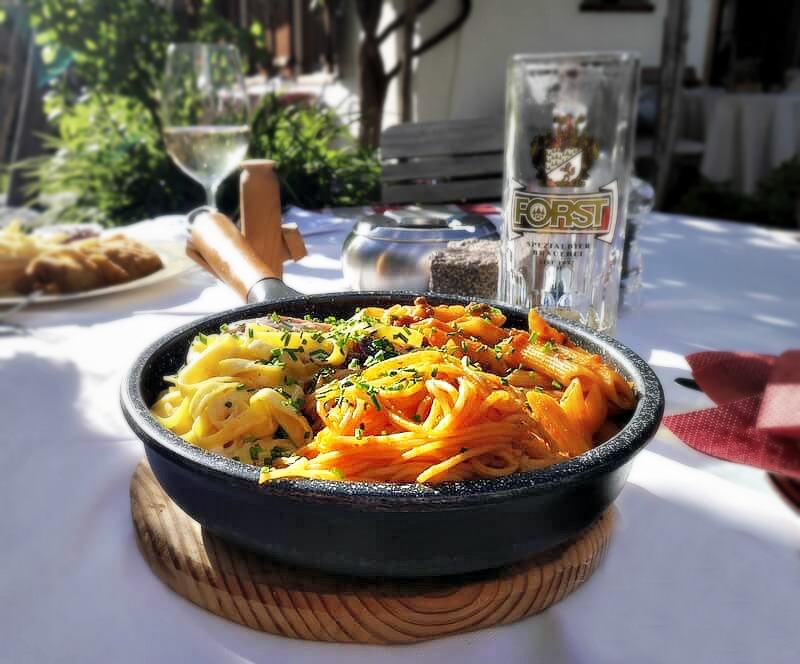 The Best Forking Meal in South Tyrol? Coffee Break German Podcast: This podcast has free and members-only versions. While there are additional bonus materials available to members, the free podcast is incredibly valuable. Out of the three resources we mention here, this is the most beneficial for travel in a German-speaking region. Another advantage to this podcast is that the hosts provide details on grammar, cultural nuggets, review past lessons and break down the language. We would recommend starting with season 1 to learn the very basics. Duolingo App: There is an online version of Duolingo also, but we prefer the app version for both Android and iPhone. The app not only allows you to take lessons, but you can engage in short, situational chats to practice responses. As you progress, Duolingo provides you a percentage fluency in the language that you can brag about on LinkedIn if you’re so inclined. Pimsleur German Language Program: Older versions of the audiobooks are usually available at public libraries and are a great way to learn a language during your commute. Depending on your skill level, there are a variety of programs you can select. How to Learn a Language for Travelers: This great post walks through a comprehensive list of helpful apps, as well as additional learning tips that are both unique and fun. TAP TO SAVE FOR LATER!